In a 16-inning battle between the Rays and the Marlins that started a little after 7 p.m. on July 3 and carried on until 12:42 a.m on July 4, it was a double from Tampa’s Jake Bauers that broke a seemingly never-ending 4-4 deadlock and eventually led the Rays to an exhausting 9-6 victory. It may not have been a result that sent the (very) few remaining Miami fans home happy—but at least they all made it out of this crucible alive. The mind-numbing game featured 10 straight scoreless innings, between the sixth and the 15th, but it’s not like both sides didn’t have opportunities to bring the contest to a more tolerable end. The Rays got 20 hits, and the Marlins had 15, but each time a team threatened, they would end up doing something stupid, like when Carlos Gomez bunted into an inning-ending double play with runners on first and third in the 13th. Just when all 200 Marlins fans (give or take) still in attendance surely began questioning every life choice that led to them sticking out this baseball game, the Rays sent nine guys to the plate in a 16th inning that saw them score five merciful runs, the first of which crossed the plate courtesy of our savior Jake Bauers. 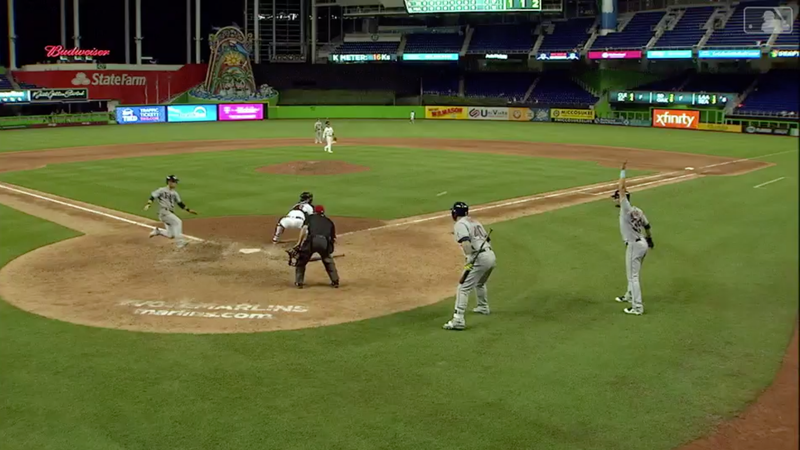 The Marlins made it scary, tagging catcher-turned-closer Jesús Sucre for some hits and getting the tying run to the plate in the bottom of the 16th, but Cameron Maybin’s groundout consigned their weary bones to the loss column. I’m so sorry to tell you this, but these teams play again at 1 p.m. today.